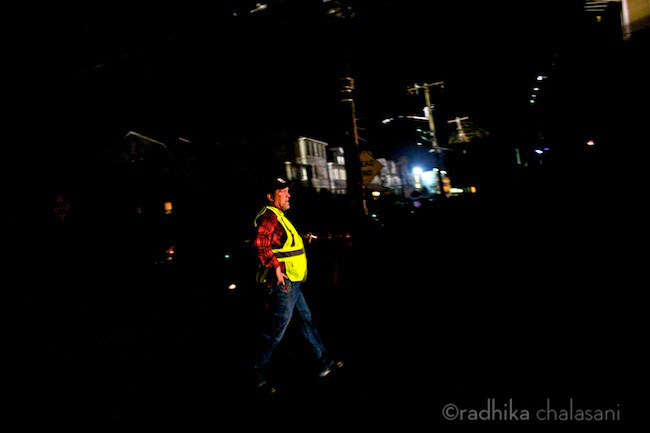 ROCKAWAY PARK, NEW YORK-NOVEMBER 10: Wayne Gearin (57), directs traffic on Rockaway Beach Boulevard in front of Occupy Sandy’s hub of operations as the area remains without power except for generators November 10, 2012 after Superstorm Sandy. Gearin, lost his home in a fire the night of the storm and immediately after started working with Occupy Sandy to give back to the community. After 40 years in the Rockaways he’s now staying with relatives in Jamaica, Queens.